RENSSELAER, N.Y. — The NYISO working group charged with shepherding carbon pricing into New York’s wholesale electricity market kicked off its efforts Tuesday by taking up the issue of how import and export transactions would be handled under the pricing scheme. To calculate locational-based marginal prices, the examples in the presentation focused on prices at one NYISO proxy generator bus located outside the New York Control Area to represent a typical bus in an adjacent control area. There may be more than one proxy generator bus at a particular interface with a neighboring control area to enable the ISO to distinguish the bidding, treatment and pricing of products and services at the interface. Imports into the NYISO market are paid the proxy generator bus price for the applicable external control area. 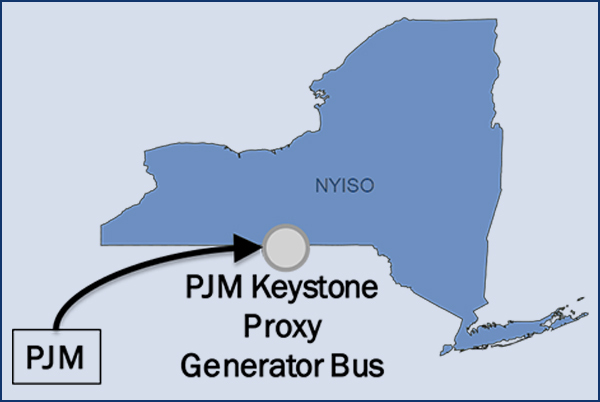 For example, an import with costs of $40/MWh in the PJM market could sell at the $50 PJM Keystone Proxy Generator Bus price in the NYISO market for a potential net revenue of $10/MWh. Several stakeholders at the meeting said they wanted better real-time data from the ISO, possibly using a unit-specific, rather than aggregated, approach. “The reason we landed on this more aggregated approach is because we wouldn’t be able to tell whether a unit-specific one is representative,” Avallone said, adding that the fundamental question about what approach to take had been fully aired in the stakeholder process last year. Seth Kaplan of EDP Renewables, the largest wind generator in the state, said his company had no position on the matter but suggested the ISO ask for market proposals for a unit-specific approach from those who were advocating one. Howard Fromer, director of market policy for PSEG Power New York, offered that the ISO could provide day-ahead carbon data to help traders to better ascertain the right carbon adder in order to plan their bids. Scott Leuthauser, manager of regulatory affairs and business development for H.Q. Energy Services (U.S.), read a prepared statement saying his company opposes applying the carbon charge, as proposed, to external transactions because it creates additional risks for them. External resources have no control over NYISO carbon emissions and no way of physically hedging against the risk, he said. “As we have said before, it is better for traders to assess and bear the risk,” Avallone said. The MIWG next meets Jan. 22 to review Tariff sections impacted by a carbon adder. NYISO is speeding up the stakeholder process in order to implement by June a Zone J (New York City) reserve requirement and procure 500 MW of 10-minute reserves and 1,000 MW of 30-minute reserves, the MIWG learned Tuesday. Ashley Ferrer, NYISO energy market design specialist, told the working group that creating a Zone J reserve region and associated reserve requirements can provide more efficient scheduling and procurement of resources, as well as location-specific market price signals. The ISO is considering the appropriate operating reserve demand curve for the zone’s reserves and will present its proposed pricing as part of further discussions regarding the proposal, Ferrer said. Establishing a separate Zone J operating reserves requirement was originally recommended in the 2017 State of the Market report and later in the 2018 Management Response to an assessment by Analysis Group of wholesale market options regarding performance assurance. The ISO will present market design and associated Tariff revisions to stakeholders this month and next, with the Business Issues and Management committees slated to vote on the proposal in March. Assuming stakeholder approval, the ISO would submit the proposal to the Board of Directors in April and file Tariff revisions with FERC seeking approval to implement in June. New York’s Integrating Public Policy Task Force hit resistance from the get-go when it unveiled its final work plan for pricing carbon into the state’s wholesale electricity market.